I know people in the North Carolina region are pumped regarding the Panthers playing in the Super Bowl on Sunday, but if the GFS is right on the 18Z run just out now, folks across the Piedmont may be in for a surprise snow event tomorrow morning, courtesy of the current shortwave moving northeast right along the U.S. East Coast. GFS is showing possible quick 1-3 inch accumulations from Charlotte and all along Tobacco Road from Raleigh to Greensboro, and a much as 3-7 inches in interiors areas of the Mid-Atlantic region from DC to New Jersey. Last edited by northjaxpro on Thu Feb 04, 2016 4:59 pm, edited 1 time in total. Hammy wrote: Models have backed off significantly on both showing snow and the extent of the cold air with the next front, and have flipped to significantly above normal for the end of the run. I'm personally expecting only slightly below normal temps at this point given the longer trend over the last few days. Despite that, some areas getting snow flurries/showers wouldn't at all surprise me. But yes, them backing off on the amounts is no shocker as this is not an easy way for your area to get accumulating snow since it tends to dry up as it comes across the mountains. I'd consider it a victory, assuming you like snow, if you get any accumulation. The posts in this forum are NOT official forecasts and should not be used as such. They are just the opinion of the poster and may or may not be backed by sound meteorological data. They are NOT endorsed by any professional institution or storm2k.org. For official information, please refer to the NHC and NWS products. The latest 18Z GFS just out now is indicating that the coastal storm which will develop Sunday off the Southeast U.S. coast , looks to be far enough off the coast in which there will only be light precip right along the coastal regions, which may produce light flurries right along the coast of North Carolina and South Carolina as there is a cold pocket of air aloft associated with the strong cut-off upper Low, situated just west of the storm system. Fortuntely this time, it appears the cold air aloft is lagging back a bit too far behind this system, and the storm doesn't really begin to intensify until Sunday night. These factors appear likely to have kept a potential winter storm from happening across Eastern North and South Carolina on Sunday. 534 and 540 partial thicknesses are in place right along the coast, which could support light snow/flurries occuring in those areas just before the storm pulls away from the region and intensifies late Sunday into Monday. This storm is forecast to intensify to 998 mb about 300 miles east of Cape Hatteras, NC by 0Z Sunday evening. Last edited by northjaxpro on Thu Feb 04, 2016 6:25 pm, edited 3 times in total. Nws just put in a chance of snow for early Sunday morning. Wouldn't be any accumulations if it happens but it would be nice to see again. Hey SeGaBob. We both saw flurries back on January 23 at our respective locales that day. 2 straight years of having trace of snow at my locale, which is a a very rare occurance! Yeah I heard you got some but I haven't been on since then. I think we both had flurries the same day last year as well. THE MODELS SHOW COLDER AIR MOVING IN FROM THE WEST SUNDAY MORNING. LONGEST AROUND THE TRI-COUNTY AREA...POSSIBLY INTO LATE AFTERNOON. Yeah, light snow/ flurries fell January 8, 2015 here as well SeGaBob. Yeah the Charleston, SC mets are spot on. It is a shame (if you want to see snow) that this system will organize and deepen farther offsore on Sunday because a couple of days ago, this system was showing potential to produce a decent snowfall across the eastern portions of the Carolinas had the system developed and intensified a bit closer to the coast and the deep cold air pocket aloft with the mid-upper level Low had caught up to the system from the west. But, some folks in North Carolina may see snow late tonight into tomorrow morning from the current coastal Low Pressure system impacting the region and heading northeast, which I discussed above. I ended up with exactly 5 1/2 inches of rain from this system. They were only calling for 2-3 but i'm not complaining. That is a lot of rain for one day. That is impressive any time, but especially for this time of the year when it is normlly are driest time of the year. This El Nino has been really something this season. Way above average for rainfall here as well. I measured just under 1.5 inches with this current system as well and still raining currently. SeGaBob wrote: Nws just put in a chance of snow for early Sunday morning. Wouldn't be any accumulations if it happens but it would be nice to see again. A similar setup on 2/8/1968 (storm strengthened just offshore) gave mainly only the SAV area a major snow: 3.6", which had been the highest on record (since 1871)! It was so localized that CHS got nothing! The 18Z NAM has what may be snow or rain mixed with snow falling in SAV and other parts of SE GA on Sunday 2/7. 850's fall below 0C then. Something to watch for SE GA and perhaps even into NE FL. NWS Charleston doesn't seem to buy the NAM solution. FOR A PERIOD OF WET SNOW LATE SATURDAY NIGHT INTO SUNDAY MORNING. THE WITHIN THE HAZARDOUS WEATHER OUTLOOK. Also they took the snow chance out here. ^I don't blame CHS for being skeptical about the recent NAM solutions as that model has a tendency to have too heavy precip. Since it would appear that any sig snow would require fairly significant rainfall rates to bring down the cold air (dynamic cooling) to cool it down enough to the surface, too heavy precip being progged may very well mean that the NAM is too cold at the sfc and has fictitious snow. I'd like to see more support for that much precip from other models before betting on the NAM's accumulating snow. Also, the climo of SE GA (especially near the coast)fairly rare accumulating snow warns me to be cautious before buying into it. No matter what happens, however, this is exciting to try to forecast due to the potential though maybe not high of a historical event for SE GA and vicinity. If the model trend goes further west and the precip tend on the consensus gets heavier, then the likelihood of this becoming a wintry event of significance rises. Keep in mind that Feb has had more than its share of SE GA/S SC wintry events going back in history. 0Z NAM just went unrealistic on the snow. It would be nice to see, but that's just not going to happen with temps at 32 degrees. And yeah Larry, climo isn't that great here for snow. Only time I've ever seen it accumulate was in February 2010. Well, the 18Z GFS is back on board with showing potential snow on the backside of the storm system across Eastern North Carolina possibly extending down into South Carolina. This is what the GFS was showing roughly 36 hours ago, but dropped the idea in yesterday's runs. Now it is back to showing this again, with the idea that the storm system will get close enough to the coast to allow the deep cold pocket associatred with the strong upper Low to bring the possibility of winty precip Sunday morning. 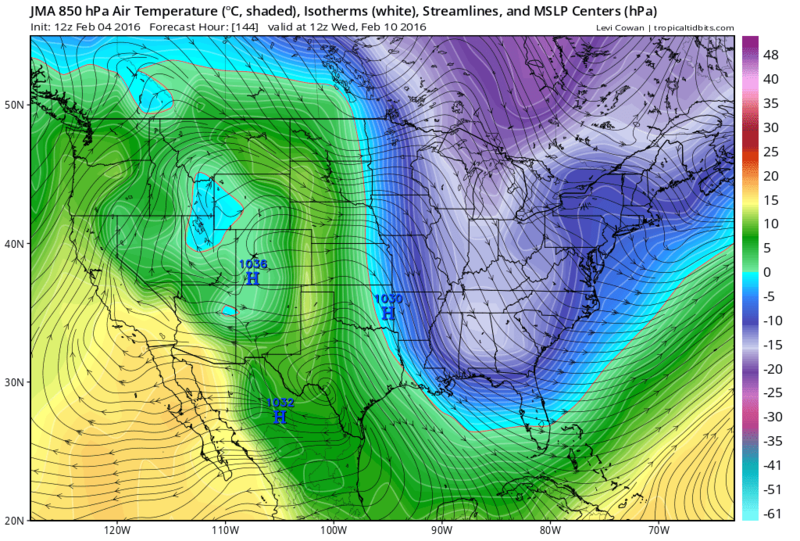 The 18Z GFS depicts that extremely cold air pocket with the Upper Low very well, showing a large pocket of 534 partial thickness line directly over most of Georgia and into upstate South Carolina, along with the 540 thickness line from North Carolina south all the way down into Northeast Florida. It is a very interesting situation which I discussed earlier above on this page. if this storm system unexpectedly can get cranking a bit earlier than forecast and develop even closer to the Southeast U.S. coast , the potential for a surprise snow event would increase across Eastern N.C, down the coast as far south as SE GA, depending upon how much wrap around moisture can spread inland into that deep cold air aloft. Definitely worth monitoring even here in Jax because if this storm system overperforms more than expected, Sunday morning could get quite interesting along the immediate SE U.S. coast. SeGaBob wrote: 0Z NAM just went unrealistic on the snow. It would be nice to see, but that's just not going to happen with temps at 32 degrees. I see that the 0Z NAM has gone insane batshoot crazy with 1.25" of qpf for you and 1.50" for SAV AFTER the 850's and 925's cool below freezing. IF that were to really occur, then that would probably really mean a historic snow event for SE GA and vicinity. However, is this just fantasy? Very likely. As CHS has stated about the NAM and per the fairly rare occurrence of accumulating snow in SE GA, I feel we're right to treat this with a huge grain until if and when other models join in with this very heavy precip. The NAM is absolutely notorious for way overdoing precip amounts in the SE during winter events. For the fun of it, however, IF what the NAM shows were to somehow occur, it would be the heaviest SN storm for SAV and much of SE GA since at least the 1830's. Going back to the 1840's the heaviest on record there are the 2/8/1968 and 12/22-24/1989 3.6" snowstorms. Last edited by LarryWx on Fri Feb 05, 2016 9:44 pm, edited 1 time in total. WOW!!!. That is insanely crazy by the NAM. 10 inches north of Savannah? 10 inch totals near Fort Stewart? Well, I am not anticipating that to happen. That would be crazy insane. But remember, our event on November 1, 2014. I often chat about that event and have posted about that on several occasions. A very deep cold core Upper Low moved in from the northwest and bought 6 inches of snow to Lexington, SC that day. These cold core Upper Lows have very cold temperatures aloft, and if there is moisture in place to bring down significant dynamic cooling at the surface, you can get some impressive snow accumulation in a short time, like what happened that day. The big questions are: 1) Can the storm system can organize quicker and closer to the coast, and 2) Will there be enough significant moisture from the deepening storm system off shore to wrap around far enough inland into that cold pocket of air aloft to bring about possible snow on Sunday morning. Thermal profiles do support wintry precip just inland from the coast from NE FL north to Eastern NC. Quite interesting situation to watch over the next 36 hours. Last edited by northjaxpro on Fri Feb 05, 2016 9:57 pm, edited 3 times in total.